Perhaps Rapunzel slept in this tower? The New York Times features The Wall Street Church with the $6 Billion Portfolio this morning. Authored by Jane Margolies, it will be in the Sunday Print Edition. 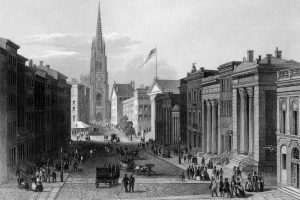 While the mass of the 14-acre holdings controlled by the church lie downtown, the article highlights the scale of the stakes–plus, there are Upper West Side ties. Although not explicitly mentioned, Disney/ABC Broadcasting Company will be relocating to Trinity property in Hudson Square which will require the demolition of at least four buildings downtown. The author credits the developer with giving a nod to the community in allowing them to participate in the design of the base of a much taller building that replaced near century-old structures. While some of the trends outlined may seem inevitable, Margolies highlights the disparity between Trinity and other smaller parishes and churches which are threatened. While their namesake church may be restored (partly at the expense of 14 other acres of Manhattan), will this reality result in just a few “mega” churches standing? Yet another consideration as ABC, one of the largest employers in the Upper West Side decamps for other pastures, and new owner Silverstein Properties undoubtedly plans bigger still interventions on their Columbus Avenue and West End Avenue campuses.